Home › extra_recipe jailbreak › extra_recipe Jailbreak For iPhone 7 & 7 Plus On iOS 10.1.1 Released! Luca Todesco has just released new extra_recipe+yaluX jailbreak for the public. Now you can jailbreak your iPhone 7 & 7 Plus with this new tool on iOS 10.1.1 firmware. What is extra_recipe jailbreak ? This is the modified version of match_portal jailbreak to resolve the stability issues on iPhone 7 & 7+ devices on iOS 10.1.1 jailbreak. As you may know, previous yalu + mach_portal jailbreak of iOS 10.1.1 was not stable on iPhone 7/7+. 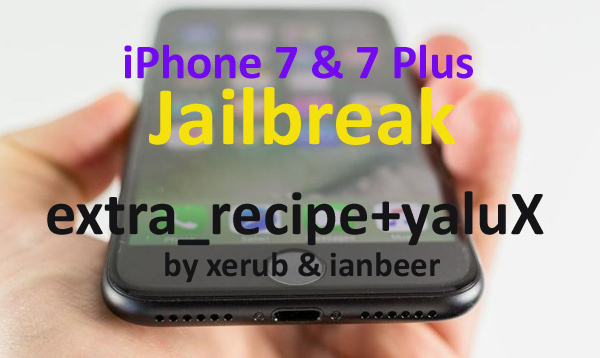 Here’s all what you know about extra_recipe jailbreak? How to jailbreak iPhone 7 / 7 Plus on iOS 10.1.1 with extra_recipe+yaluX ? Just download extra_recipe+yaluX.ipa & install to your device with Cydia Impactor tool. If you want some help, follow this link for step-by-step tutorial. extra_recipe jailbreak procedure is also same as the mach_portal jailbreak procedure, but extra_recipe will not be automatically installed Cydia on your device during the jailbreak process. The extra_recipe jailbreak is in early stage & currently at beta 1. So, do not recommend using the current release if you’re already jailbroken. Just keep using mach_portal+yaluX until the next update that will fix issues in the current beta 1 version. Update 1: extra_recipe+yaluX beta 3 released with substrate support ! Update 2: extra_recipe+yaluX beta 4 released with substrate & iOS 10.0.x support ! Keep in touch, we’ll let you know when next update release. Follow us on Twitter, add us to your circle on Google+ or like our Facebook page for many more..